A randomised open label study of the combined use of paracetamol and ibuprofen to rapidly reduce fever is reported. The advantage of using both medications is less than half a degree centigrade in the first hour, and insufficient to warrant routine use. Every day parents and healthcare professionals treat febrile children using ibuprofen and paracetamol. The practice of giving both medicines simultaneously is widespread,1 but unsupported by evidence. Their use has been driven in part by a perceived need to prevent febrile convulsion, although evidence that antipyretics prevent such convulsions is also lacking.2 We assessed the short term effectiveness of a combined dose of paracetamol and ibuprofen in reducing childhood fever. We conducted an open label, three arm randomised trial in our inner city Children’s Emergency Department. Participants received suspensions of paracetamol 15 mg/kg, ibuprofen 5 mg/kg, or both. Consecutive children between 6 months and 10 years old attending with a fever of 38.0°C or more were included. Children were excluded if they had received either drug in the last six hours, were shocked, immunosuppressed, or had other known contraindications to either medicine (see box 1). Carers gave written informed consent. The primary outcome measure was the child’s temperature at one hour. Secondary outcomes included temperature at two hours and the time spent in the department. Too few children had data at two hours to allow meaningful comparison, as they had already been discharged home. Secondary outcome analysis of the time spent on the unit did not add to our findings and is not reported. Temperatures were measured using a tympanometric thermometer (Thermoscan, Braun Ltd, UK) at the time of admission, the time medication was given (T0), one hour later (T1), and two hours later (T2) if the child had not been discharged. Temperatures were measured in the presenting ear by a single reading according to the manufacturer’s instructions. Painful ears were avoided and normally a single observer would measure each child. The sample size was calculated from pilot data collected using study methods, operators, and equipment. We judged a temperature difference of 1.0°C at one hour to be of clinical significance. To have an 80% chance of detecting this difference, at the two sided 5% level and including a 15% drop out rate before one hour, 40 children per group were required. The allocation sequence was block randomised and generated independently of the research team. Allocations were placed in sequentially numbered sealed opaque envelopes. Staff working in the department used the next envelope in the sequence to allocate participants. Mean temperatures were compared using a one way ANOVA with and without covariate adjustment for baseline temperature. Multiple comparisons were performed using Scheffe tests. The Gloucestershire Research Ethics Committee approved the study. A total of 123 children were randomised between October 2004 and January 2005 (fig 1). Baseline data were similar in all three groups, except that more children were admitted to hospital in the combined group (13/36) compared to the ibuprofen (3/35) and paracetamol groups (5/35). A notes review of admissions showed that one child from the combined group looked non-specifically unwell following the administration of study medication, during a rapid temperature drop from 39.5°C to 37.7°C in one hour. She was admitted for observation, recovered spontaneously, and was discharged three hours later. All other admissions were not related to new clinical events following the administration of study medication. One child in the paracetamol group received a dose of 27.8 mg/kg in error. The child did not suffer any adverse consequences from this overdose. There were no other adverse events. Flow chart of subject enrolment to one hour (T1) post-dose. All children with data at T1 (n = 108) were included in the primary analysis on an intention to treat basis. There was a significant difference between the three groups overall at T1 (p = 0.023; table 1), which was unchanged by adjustment for baseline temperature. Pairwise comparisons showed a significant difference between the combined group and paracetamol alone (mean baseline adjusted difference at T1 0.35°C; 95% CI 0.10 to 0.60; p = 0.028), but not between the combined group and ibuprofen (0.25°C, 95% CI −0.01 to 0.50; p = 0.166). The difference between the ibuprofen and paracetamol groups was not statistically significant (0.10°C, 95% CI −0.15 to 0.36; p = 0.735). Combined paracetamol and ibuprofen were better at reducing fever after one hour than paracetamol alone. However, the effect is less than half a degree centigrade, and we do not believe that this is a clinically important difference over this time period. We did not show a difference between combined therapy and ibuprofen. Our study was powered to detect a difference between combined therapy and paracetamol alone, and by doing so we have demonstrated proof of principle. The greater efficacy of ibuprofen3 would require a larger sample size to show a significant difference. This study was carried out in a paediatric emergency department, and therefore only examined the short term control of pyrexia. A longer measurement period might produce different results, as the maximum decrease in temperature for both medicines is around three hours post-dose.3 In the emergency department we were unable to keep children back for study after discharge and in consequence, only one third (39/123) of children had their temperatures recorded two hours post-dose. An alternative dosing schedule may also produce different findings. The synergism that we have demonstrated between paracetamol and ibuprofen suggests that alternating antipyretics may achieve better fever control over the course of an illness, but further research is required. These medicines are frequently prescribed without incident, but occasionally have significant side effects including renal failure4 and hypothermia.5 Thus the administration of both paracetamol and ibuprofen together should be used with caution. In summary, although there is benefit from combined antipyretics, this effect is not large enough to warrant routine use for rapid fever reduction. In the context of paediatric emergency medicine, where rapid control of pyrexia is often desirable when making decision about disposition, we believe our findings will be useful when dealing with an acutely febrile child. The authors would like to thank Samantha-Jayne Tanner and Jessica Blissett for their administrative help with this study. We would also like to thank the staff of the CED and the parents and children who participated. Mayoral CE, Marino RV, Rosenfeld W, et al. Alternating antipyretics: is this an alternative? Pediatrics2000;105:1009–12. Uhari M, Rantala H, Vainionpaa L, et al. Effect of acetaminophen and of low intermittent doses of diazepam on prevention of recurrences of febrile seizures. J Pediatr1995;126:991–5. Perrott DA, Piira T, Goodenough B, et al. 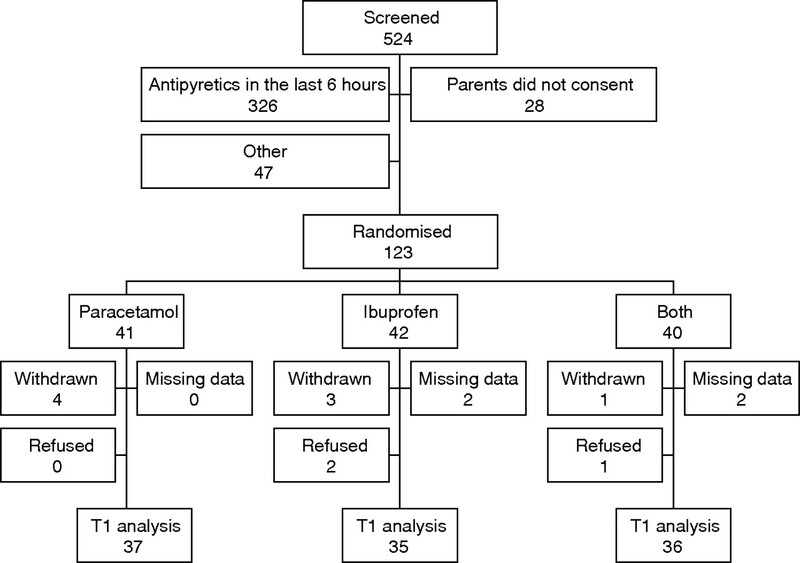 Efficacy and safety of acetaminophen vs ibuprofen for treating children’s pain or fever: a meta-analysis. Arch Pediatr Adolesc Med2004;158:521–6. Moghal NE, Hegde S, Eastham KM. Ibuprofen and acute renal failure in a toddler. Arch Dis Child2004;89:276–7. Richardson J, Sills J. Hypothermia following fever. Arch Dis Child2004;89:1177.